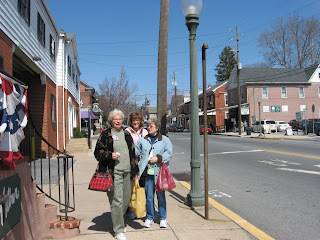 Right now I'm lookng forward to going to the Quilter's Heritage Celebration at Lancaster, PA which is April 2-5, 2009. Several of us are driving down, meeting HMM and Fabaddict, Sage and Nan there. I'll be wearng my Purple Churn Dash pin and earrings. 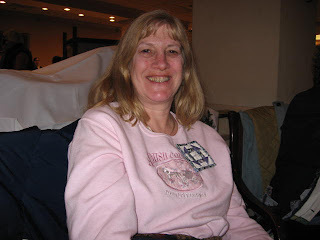 Last year I met some other AOL quilt chat women at the show. 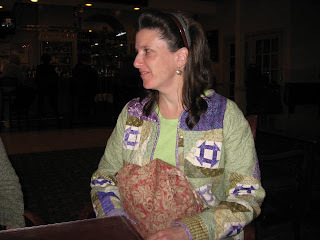 There's Kattig in her green jacket with the Purple Churn Dash blocks all over it. And then Helen Marie, Deb and Jackey in front of the Wilbur's Chocolate Factory. Rose is appropriately dressed in pink. I finally got to meet Helena Crocker who is wearing a Purple Churn Dash name tag around her neck. 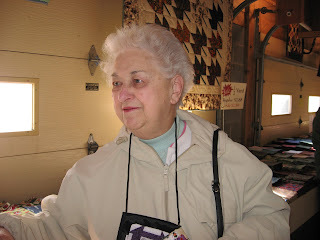 My second "looking forward to" is a quilt retreat in late April at Casowasco. This is put together by members of the Chenango Piecemakers Quilt Guild. My third "look forward to" is a Full Spectrum: From natural Fibers to Quilts and the Textile Arts show at Binghamton University Sept. 10-Dec 5, 2009. It sounds like a wonderful exhibit at BU's Art Museum. Lots going on and lots to sew.